WAGABOX® is a breakthrough landfill gas recovery and upgrading technology. The result of ten years of R&D at Air Liquide and Waga Energy, WAGABOX® combines two upgrading processes: membrane filtration and cryogenic distillation. Membrane filtration removes the carbon dioxide (CO2) and impurities from landfill gas. The gas is then cryogenically cooled to separate the methane (CH4) from the oxygen (O2) and nitrogen (N2). Regardless of the composition of the raw biogas, Wagabox® produces 98% pure biomethane — pure enough to meet utilities’ grid-injection standards. 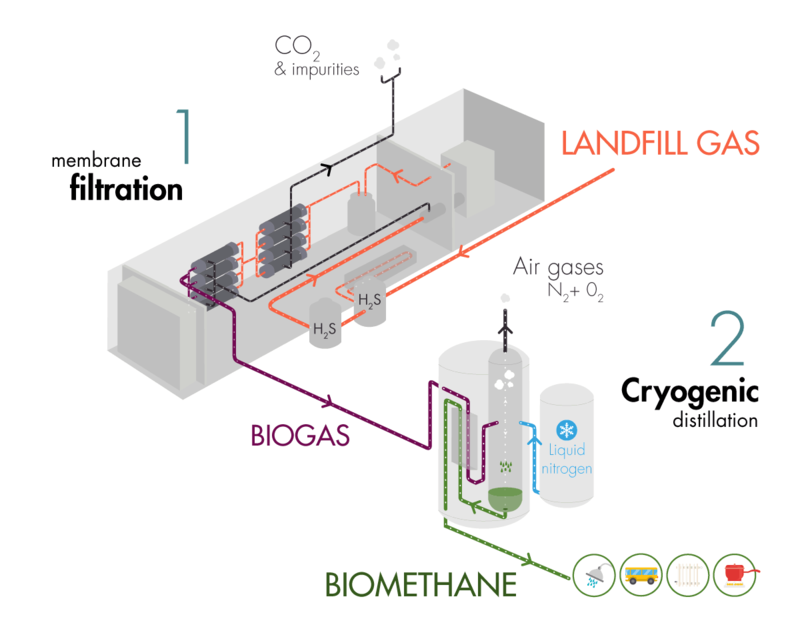 WAGABOX® successfully recovers 90% of the methane contained in landfill gs, for energy yields that are three times higher than solutions where the gas is burned to generate electricity. Plus, biomethane is easy to transport and store using existing gas infrastructure. WAGABOX®, available exclusively from Waga Energy and protected by patents worldwide, is becoming the benchmark solution for landfill gas upgrading. Lanfill gas is a complex mixture made of methane, carbon dioxide, air (oxygen and nitrogen), and impurities. Recovering the methane is extremely challenging due to the air in the gas. In addition, the composition and flow rate gas is highly variable and unpredictable: methane concentration may fluctuates daily because of weather conditions (temperature, humidity). The biogas upgrading systems used for anaerobic digestion plants (that produce biomethane from agricultural or agro-industrial waste) are inefficient. Therefore, most landfills simply release their gas into the atmosphere or flare it avoid greenhouse gas emissions. Landfill gas may also be burned in Combined Heat and Power (CHP) plants. However, the energy yields is low and the heat is rarely usable as landfills are generally far from urban area. Waste is a major source of greenhouse gas (GHG) emissions — as methane is a much more powerful greenhouse gas than carbon dioxide. That is the reason why some countries — including France — require landfill operators to collect and flare their gas. Nevertheless, landfills are responsible for about 5% of global GHG emissions. Today, millions of cubic meters of energy-containing gas are simply lost or goes up in smoke every hour around the globe. Waga Energy is putting a stop to this massive-scale waste by transforming a source of pollution into clean, local, and renewable energy. « WAGABOX® is one of the greatest achievements of Invest in the Future (the French government’s economic stimulus program administered by French energy agency Ademe). It is an highly-innovative project that responds to the three pillars of sustainable development: social, environmental, and economics. It is also a prime example of France’s position of leadership in gas engineering ».